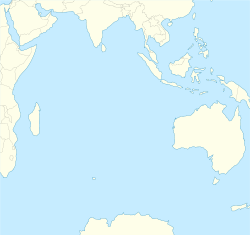 ^ "Track of the Calcutta East Indiaman, over the Bassas de Chagas in the Indian Ocean". Catalogue.nla.gov.au. Retrieved 2012-06-21. ^ "House of Commons Hansard Written Answers for 21 Jun 2004 (pt 13)". Publications.parliament.uk. Retrieved 2013-10-20. ^ "Chagossians fight for a home in paradise". The Sunday Times. 2010-03-06. Archived from the original on 2011-09-24. Retrieved 2012-06-21. 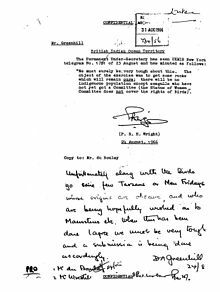 ^ "Mauritius to reiterate its conditions for renewed talks with UK on Chagos". Archived from the original on 2011-12-23. Retrieved 2011-12-23. 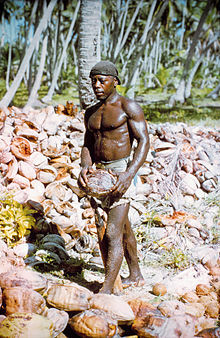 ^ "Chagos islanders cannot return home, UK Foreign Office confirms". The Guardian. Retrieved 2017-08-26. ^ "The World Factbook". Cia.gov. Retrieved 2013-10-20. ^ John Pike. "Diego Garcia "Camp Justice"". Globalsecurity.org. Retrieved 2012-06-21. ^ "Welcome to the Chagos Conservation Trust | Chagos Conservation Trust". Protectchagos.org. Archived from the original on 2012-01-19. Retrieved 2012-06-21. ^ "Consultation on Whether to Establish a Marine Protected Area in the British Indian Ocean Territory". Archived from the original on 2010-02-06. Retrieved 2010-02-06. ^ PA (2010-09-12). "Billionaire saves marine reserve plans". London: Independent.co.uk. Retrieved 2012-06-21. ^ Rob Evans and Richard Norton-Taylor (2 December 2010). "WikiLeaks: Foreign Office accused of misleading public over Diego Garcia | Politics". London: The Guardian. Retrieved 2013-10-20. ^ "Hmg Floats Proposal For Marine Reserve Covering". Embassy London. WikiLeaks. 2009-05-15. Retrieved 2010-12-02.